When it comes to refugee policy, Prime Minister Justin Trudeau has two stances: one on Twitter, and the other on paper. Nowhere is that more clear than in Emerson, Manitoba, a small border town with a population of 700 people, that has made its way to international headlines due to the sharp increase in the number of asylum seekers entering Canada near the border crossing. In 2017 alone, at least 190 people, have made the decision to take this dangerous journey and cross into Canada to claim asylum. Between April and December of 2016, 410 immigrants made the crossing. And while there has been an outpouring of support for refugees from Manitobans over the last few months, there have also been many who have called on authorities to implement stricter regulations at border crossings in order to slow down the influx of asylum seekers. The number of refugee claimants entering Manitoba has increased significantly since Donald Trump’s election to the American presidency last November. A number of claimants who have made their way into Canada have even cited Trump and his infamous executive order – the “Muslim ban” – as the reason why they decided that asking for refugee protection in the U.S. would be a fruitless effort, fearing deportation. It is also important to keep in mind that in addition to the growing intolerance spreading across the Western world, we are living in a time where the number of people who have been forcibly displaced from their homes is at a record high. A 2015 UNHCR report concluded that the number of people forcibly displaced from their homes globally, either within their home country or outside their home country, is at 65.3 million. This means that one person in 113 is a displaced person. This number is greater than the population of Canada, Australia, and New Zealand combined. And while Prime Minister Justin Trudeau painted a rosy picture of Canada’s openness on Twitter, claiming to welcome all those “fleeing persecution, terror and war,” his viral tweet left out an important and strict agreement that Canada adheres to: the Safe Third Country Agreement. Under the Canada-U.S. 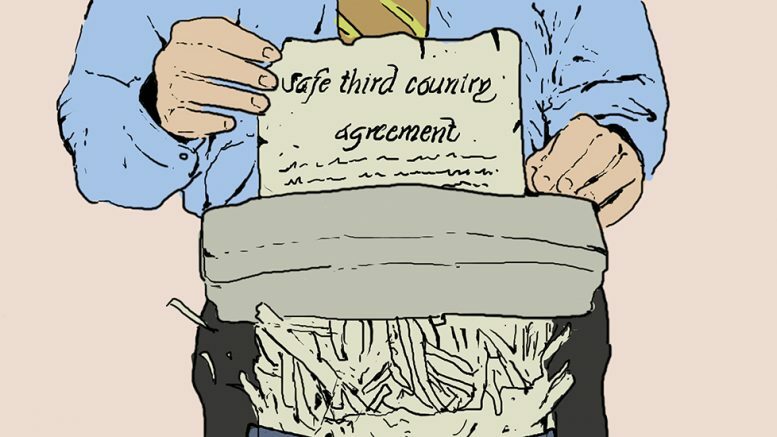 Safe Third Country Agreement, which came into effect in 2004, the U.S. is considered a ‘safe country,’ which is meant to denote a state where claiming refugee protection is possible. The agreement forces refugees to make their asylum claims in the country they first landed in. This bars asylum seekers who wish to make their claim in Canada but arrived in the U.S. first. As a result, any refugee claimant coming from the United States into Canada through regulated border crossings is denied entry. Because this agreement only applies at regulated border crossings, very few are claiming asylum at official border crossings, and many are instead opting to risk their lives and limbs and trek for hours through the harsh and unforgiving winter weather by “illegally” crossing into Canada through farmers’ fields. Because once a claimant enters Canada, the state must abide by the 1951 United Nations Refugee Convention, which “asserts that a refugee should not be returned to a country where they face serious threats to their life or freedom.” In other words, while it is technically “illegal” to cross into Canada outside of an official border crossing, international law requires refugees be protected from punishment and deportation on the grounds that they are fleeing persecution. Many across the country are calling on the Liberal government to amend and even scrap the Safe Third Country Agreement, including much of the law community as well as the NDP. Students at the University of Manitoba Robson Hall faculty of law held a research-a-thon to draft legal memos as part of the nationwide effort to scrap this agreement. One can make a logical, sound argument on why scrapping the Safe Third Country Agreement and opening our borders has economic, societal, and even cultural benefits. Trudeau said it best: “diversity is our strength.” But the moral, humanitarian argument should beat out all other arguments, and now more than ever the Liberal government has a moral obligation to scrap the Safe Third Country Agreement. Even after an appeals court upheld the suspension of Trump’s ban, those seeking protection from persecution will remain in danger, especially considering the Trump administration will be trying its hand at a second attempt. A report from Harvard Law School concludes that the United States cannot be considered a “safe country” for asylum seekers anymore because Trump’s executive orders highlight “this administration’s hostility toward refugees and asylum seekers.” The report points to the grave potential consequences of Trump’s executive orders on immigration, which include inhuman and arguably unconstitutional actions such as the large-scale detention of asylum seekers, the removal of refugees without due process, the empowering of local officials to detain individuals on mere suspicion of immigration violation, and permitting discrimination based on asylum seekers’ religion and nationalities. When two Ghanian refugees almost died after walking for hours to cross into Manitoba from the U.S. on Christmas Eve, losing most of their fingers and toes due to frostbite, Ottawa should have immediately taken a stronger stance and either amended or scrapped the Safe Third Country Agreement. If Trudeau meant what he wrote in his viral tweet about Canada’s commitment to openness in the wake of Trump’s travel ban, then his Liberal government should ensure that those who cannot now count on safe haven in the U.S. can find it here.